This sturdy, 4-post steel table is perfect for Animation Classrooms and Students that want the complete table. 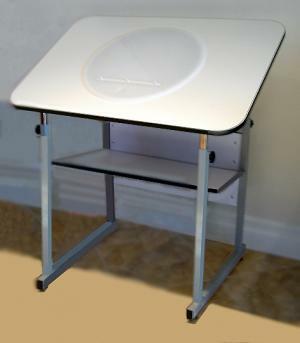 17 3/4" X 3/8" thick Student Pro Disc, pegbar of your choice, back light unit which is pre installed and ready to use. Our light is self contained Stainless Steel box with (2) 15 watt color corrected bulbs attached to a single switch for bright white even lighting.